Political campaigns are often associated with short, catchy slogans, such as the “yes, we can” catchphrase of the Obama campaign in 2008. Slogans such as these do important political work by reminding the public about the candidate as well as the ideas the candidate represents. Even in situations where detailed rehearsals of the candidate’s positions on issues are not possible, slogans index and reinforce those ideas in the minds of voters. Drawing on the Bakhtinian inspired idea of intertextuality, this chapter illustrates the way slogans enter into social circulation as intertextual series and gain traction in American public discourse. 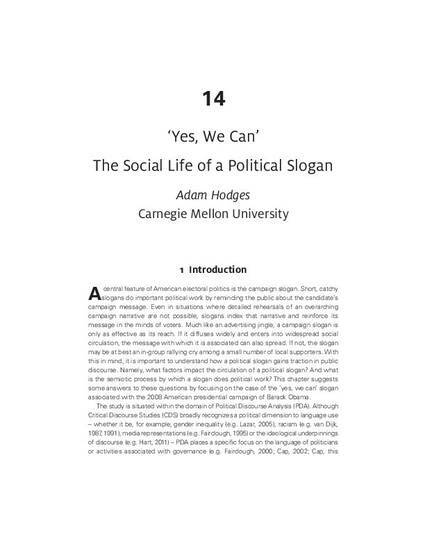 The analysis traces the social life of Obama’s “yes we can” campaign slogan as it is recontextualized across different situations of use, especially as these recontextualizations and creative reworkings authenticate and reinforce the slogan’s social value. The notion of power—namely, Foucault’s notion of power as circulating throughout the social body in “a net-like organization,” as well as Bourdieu’s conception of power as capital—is used to explain the effectiveness of this particular political slogan and, more broadly, why some political slogans are more effective than others. The analysis holds implications for the way power operates through discourse to serve political goals.